There’s no food fight quite like one that exists between two states fighting for ownership of an origin story. Take Pennsylvania and Maine, for example. For nearly 100 years, these northeast locales have been duking it out for whoopie pie supremacy. You read that right, whoopie pie. The palm-sized, chocolate sandwich-like goodie anchored together by creamy vanilla filling has been at the heart of a multi-state tug-of-war with no end in sight. So which state owns bragging rights? The earliest claim appears to belong to Maine. In 1925, Labadie’s Bakery opened its doors on Lincoln Street in Lewiston, then a small mill town nestled near the Androscoggin River. Soon after, they claim to have sold the first Maine whoopie. But, alas, there's no documented proof. All of the bakery’s early files were destroyed in a fire. Evidence or not, Mainers insist the whoopie pie’s birthplace is the Pine Tree State. Dozens, if not hundreds, of bakeries throughout the state make and sell whoopie pies—as many as 100,000 per year, according to Robert S. Cox in his book New England Pie: History Under a Crust. It seems Maine has a solid foundation to back up their claim. Folks in the Keystone State, however, beg to differ. They contend the creamy confections were first created in Pennsylvania Dutch Country, with recipes handed down through the generations. According to Pennsylvanians, Amish cooks made the first whoopies using leftover cake batter. Legend has it that children (and happy husbands) shouted "whoopee!” as they discovered these delicious treats in their lunch buckets. Mainers dispute that name claim as well: They'll tell you the catchy name was derived from Gus Kahn’s popular '20s show tune "Makin' Whoopee." "It's a jazzy product name," Sandy Oliver, a Maine-based food historian, told Philly.com in 2011. According to the Oxford English Dictionary, "whoopee" was coined in the 1860s as an interjection to express joy. By the time the Roaring Twenties rolled around, the term had acquired slightly risqué undertones with the period’s flaming youth. So either state could be on to something. It’s just another mystery in the whoop-de-do over the whoopie pie. What’s not a mystery is how far some people will go to stake their claim to this wondrous confection. 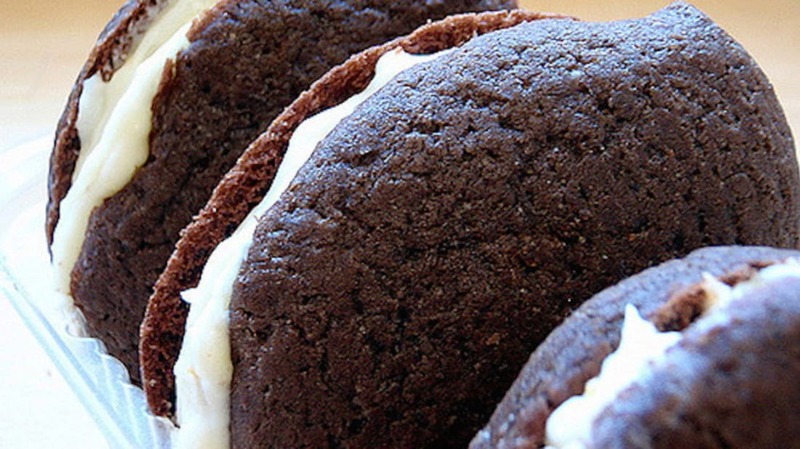 Maine's now-senator Paul Davis stirred things up in January 2011 when he introduced a bill to make the whoopie pie Maine’s official state dessert. The proposal, L.D. 71; H.P. 59, received bipartisan support despite opposing views (some felt blueberry pie deserved the recognition). Others were hesitant to support such a "weighty" bill. "Do we really want to glorify a dessert that lists lard as its primary ingredient?" Don Pilon, a Representative from Saco, asked during testimony. The designation was later changed to official state treat with blueberry pie being honored as the official state dessert. Before it passed, word of the proposed bill made its way to Pennsylvania, and residents were not happy. "We do the original," baker Nancy Rexroad told the Associated Press. "When something’s the original, you can’t improve on it." The Pennsylvania Dutch Convention & Visitors Bureau immediately launched an online petition that read "Save Our Whoopie," calling the Maine bill a "confectionary larceny." Ouch. The effort included a tongue-in-cheek video that lampooned the "misguided moose-lovers." If that wasn’t enough, Josh Graupera of Lancaster was so outraged after hearing about Maine’s pending legislation that he and a friend organized a protest in downtown Lancaster in February 2011. More than 100 Pennsylvanians rallied, holding up signs with messages for their rivals up north: "100% PA Dutch"; "Mainers, You Go Eat Lobster"; "Give Me Whoopie, or Give Me Death"; and "Whoopie Pies from Maine Taste Like Moose Poop!" Double ouch. "Generations and generations have been making and eating whoopie pies here in Lancaster," one protester said. "My grandmother did in the '30s and '40s and her mother did before her." So why not put an end to this little quarrel like responsible, reasonable adults? Why not have a whoopie pie bake off and settle the debate once and for all? Well, because there's a curve ball—called Massachusetts. It seems Bay Staters also want a piece of the pie. When writing her book, Making Whoopies: The Official Whoopie Pie Book, author Nancy Griffin made a surprising discovery—one that took her away from claims that either Maine or Pennsylvania was the first state to make a whoopie. In her research, she uncovered a 1931 ad featuring a five-cent "Berwick whoopee pie" made at Boston's now-defunct Berwick Cake Co. The faded declaration "Whoopee Pies" is still visible on the old brick Berwick building, and some believe that Berwick invented the whoopie pie to compete with Brooklyn's Devil Dogs, which were introduced in the 1920s (while possibly taking inspiration from the Pittsburgh-area treat gob, which dates to around the same time). But that's not the only story out of the Bay State. The Oxford Companion to American Food and Drink gives Durkee-Mower of Lynn, Massachusetts, the makers of marshmallow crème, credit for New England’s love affair with the whoopie pie. During the 1930s, Durkee hosted a variety show called the Flufferettes on the Yankee Radio Network. The last episode mentioned Durkee’s Yummy Book, a collection of dessert recipes including one for, supposedly, whoopie pies. But, there's a problem: In 2009, The New York Times asked Don Durkee about the story, and after checking Durkee-Mower's archives, he came up empty-handed. The best he found was that the company's first mention of whoopie pies was from the 1970s. "I'm baffled," he told the Times. A few years before the whoopie pie became Maine’s official treat, the Maine Whoopie Pie Festival was established by the Center Theatre in the small rural town of Dover-Foxcroft. The annual event is held on the fourth Saturday in June, which also happens to be the state’s official Whoopie Pie Day. Though that date has passed, you can still catch Pennsylvania’s annual Whoopie Pie Festival this weekend, on September 10, at the Hershey Farm Restaurant & Inn in Lancaster County. The inn makes over 100 different flavors for the event. With so many hands in the whoopie jar, we may never know whether the whoopie pie originated in New England or is the treasured, traditional treat of Pennsylvania. But as long as they're readily available in each location, that seems like cause for … shouting whoopee!